PEMF DR LUKE SWISS BIONIC and PEMF (Pulsed ElectroMagnetic Field Therapy) – INTRODUCTORY LETTER TO SWISS BIONIC LIFESTYLE CONSULTANTS WORLDWIDE, SEPTEMBER 2018. PEMF DR LUKE SWISS BIONIC — “My name is Lukas Barwitz. I am a passionate M.D., personal trainer and nutritionist. I’ve been in contact with Wolfgang Jaksch, Manuel Köstler and Swiss Bionic Solutions for more than a year now. Diana Walker’s Note: I am so inspired by your Courage, your Strength, and your Intellect. I can’t wait to meet you in person, Dr. Luke! In July of this year (2018), I took on the role of the Medical Director at Swiss Bionic Solutions and will from now on provide medical expertise, research and information publicly and in the back office. I found my way into the medical field via detours. From an early age, I was interested and enthusiastic about how the human body works, sports, nutrition and in general a healthy lifestyle. I was a passionate athlete, skier, played ice hockey and practised judo. My life was all about sports, up to the point that I aspired to a professional career in golf. In the spring of 2008, at the age of 16, everything changed dramatically. After a football practice in school sports I felt pain in my left knee for the first time. After taking a break and recovering for a couple days, the pain was gone. But that pain recurred more intense during the next exercise. X-ray, MRI and CT diagnostics were also not revealing. At this time, it was still assumed that I suffered from growth-dependent joint complaints or a so-called Osgood Schlatter’s disease (inflammation of the patellar ligament at the tibial tuberosity). This circle between stress, pain and recovery went on for a few weeks until I woke up one morning and could not stand up because of tremendous pain. Only a biopsy from the tibia brought clarity: diagnosis of highly malignant osteosarcoma of the left tibia metaphysis. In laymen terms: high malignant bone cancer at the top of the tibia. From here on everything escalated quickly and two days later I was moved to Munich and a high-dose of chemotherapy began. After an exhausting fight, a total of 6 complicated operations on the left knee and 36 cycles of chemotherapy over a period of 10 months, I am now a carrier of a tumor Endoprosthesis in the left knee. I am also happy to be cancer-free for the past 10 years. Although my illness and my handicap changed my plans of pursuing a career in professional sports, the experiences I gained opened my mind and paved my way into medicine. DR LUKE – MEDICAL DOCTOR AND DOING Ph.D.
After completing German high school I began my studies of medicine at the Ruprecht-Karls-University in Heidelberg in October 2011. However, I realized quite early on that my acquired knowledge in areas such as anatomy, sports physiology and nutrition was insufficient to help people to the extent I intended. As a result I started my training as a nutritionist and fitness trainer during my studies to reach higher standards. Currently I am doing my Ph.D. in the field of Uro-Oncology at the National Center for Tumor Diseases (NCT) in Heidelberg. Through Manuel I have been introduced to PEMF technology for the first time. As a classic medical doctor coming straight out of med school, I was admittedly skeptical of magnetic resonance stimulation and alternative healing methods due to the fact that these complimentary technologies are not covered in med school. However, the more I devoted myself to today’s physics, quantum theory and bionics, the better I began to understand the technology and mechanisms behind magnetic resonance. Ever since I experienced the first effects on myself, I am convinced of PEMF! With Swiss Bionic Solutions I have found my place to express my great passion for medicine and sports and to apply my professional knowledge as a medical doctor to help others achieve optimal health. My fundamental concern is to help people promote health and self-confidence through medical expertise, a healthy diet and an active lifestyle. Not only do I want to support people in their physical changes but also help them in their job, everyday life or relationships with others to live a better, healthier and especially happier life. Hence I pay special attention to health and prevention. My understanding and beliefs are based on the Salutogenesis model of Aaron Antonovsky. I am really looking forward to our healthy, successful and exciting future together! 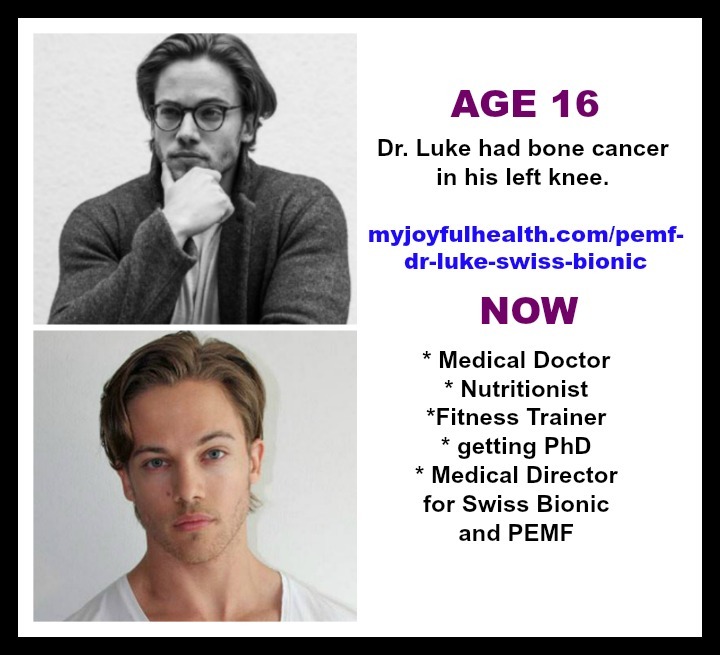 We are so excited that Dr. Luke will be in Vancouver, BC, Canada in May 2019, and look forward to meeting him and learning more about PEMF and Swiss Bionic for healthy lives, utilizing his medical expertise.